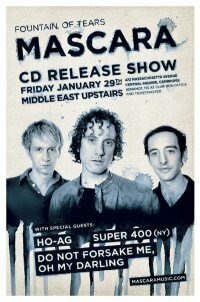 Home » Music » DNFMOMD » DNFMOMD: DNFMOMD: January 29th at The Middle East Upstairs! This show is going to be really awesome. Super-rock-trio Mascara are releasing their new CD, titled Fountain of Tears. 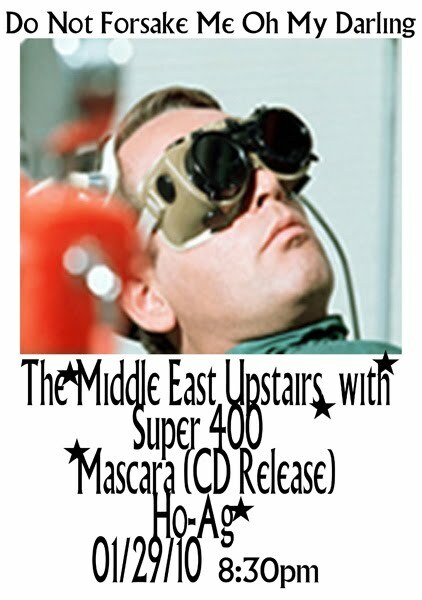 Ho-Ag who are also amazing- are headlining the night – this is a band who has covered Devo for Halloween – what more do you need to know? Super 400 are on right after us, they’re a power-trio from Troy, NY that I’ve been hearing a ton of great things about (chick-bass-player-awesomeness). Previous PostBoston Band Crush Archived Article: Food Crush: Submit a recipe to Edible Rock! Next PostThe Motion Sick: New Year’s Eve Recap!